A trip to Puerto Princesa Underground River is often paired with an adventure side trip. It could either be in Sabang X, the zipline by the sea made famous by Amazing Race Philippines Season 2, or in Ugong Rock Adventures, an ultimate destination for adrenaline rushing activities such as caving, spelunking and ziplining. My thrill-seeker husband yearned to visit both attractions, but since we were a part of a group tour, we only had to choose one and we picked out the latter. Right after our buffet lunch in Sabang, we made our way to Ugong Rock Adventures before heading back to the city. Ugong Rock is a limestone rock formation which stands 75-feet high in the middle of a rice field. Within are caves and narrow passageways leading to a viewing deck situated at the top of the stunning rock formation. It was named as such because a hollow limestone inside the cave makes an ugong or a reverberating sound when tapped. As soon as we arrived, we were oriented in a cottage near the entrance. Ugong Rock Adventures is a community-based tourism project, hence a visit could not just satiate the need for adventure but help the local community as well! Our group, my cool parents included, signed up for caving and spelunking. I'm not much of a thrill-seeker and I was quite worried that my parents might get tired halfway, but off we went when the local guide said that the climb will be fun and easy. We were led to the gear station where helmets and gloves are provided. There is also a mini-clinic nearby where my parents had their blood pressure checked before the physical activities commenced. When the sphygmomanometer displayed normal BPs, we proceeded with our family adventure. The Caving began with a short talk and a prayer. A staff then guided us inside the narrow crevices. She explained that the passageway and rock formations were caused by tectonic movements millions of years ago when the area was still underwater. She added that the cavern was used as a place of refuge during World War II. The first course was easy peasy! I really thought it would be that way all throughout until we reached the end of the narrow cave and started the uphill climb. There was an area where we had to cross a wooden bridge above the steep rocks. We also climbed ladders and boulders. My energy was nearly depleting, yet I was hyped to continue as I wanted to see more of the spectacular rock formations! Then, we reached the spelunking area which made me think twice. My body is not made for rope climbing. I felt I couldn't make it even with a harness! But when I saw how eager my parents were, I gathered all the guts and grabbed the rope. The staff were all very helpful, they assisted me in every step until I reached the top! After all the adventures that we went through, it was gratifying to see an amazing view of the lush landscape and karst mountains at Ugong Rock's viewing deck! It's worth all the sweat and sacrifices! :) We lounged in an open cottage and decided which route to take on our way down. I had enough of hiking, so I took the fastest way. Ed and I signed up for the zipline. The parents did as well, but backed out when they saw how steep and fast it is! We really thought that they'd do the spelunking again on their way down. It turned out that there's an easier trail hidden somewhere! 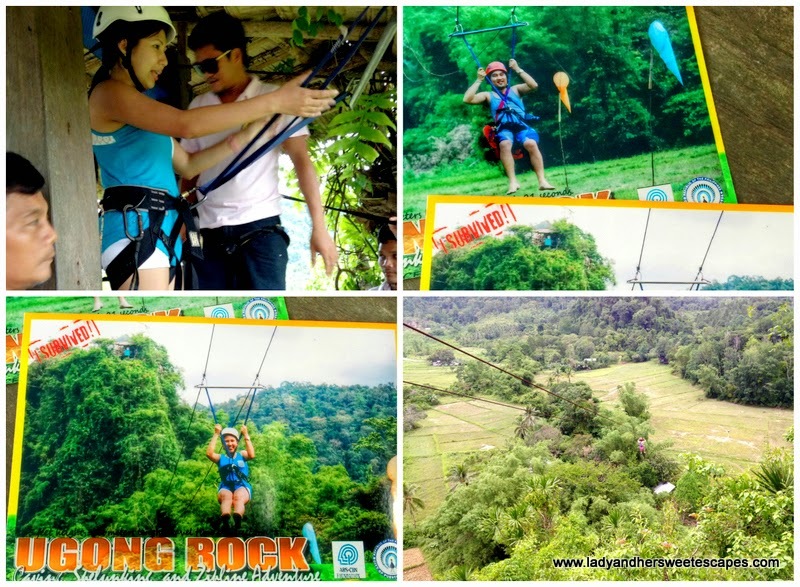 Ugong Rock Adventures' zipline is one of the fastest in the country! We had the option to do it in sitting or in superman position. Being a scaredy-cat as I always am, I chose the sitting option and convinced my husband to do it as well because the superman zipline ends in another area. I just wanted to see him waiting for me at the end of the line. Cheesy I know, but it kept me calm... as always! Ugong Rock Adventures is an optional tour and was not included in our package.